In this section you will find all options and necessary supplies for creating your own etching stencils, from traditional embossing solutions to photo-exposing and thermo-paper solutions. DEV-1 is the developer solution for our self stencil material. empty bottle into a pan and submerse the exposed stencil material. The unexposed material should start to wash out immediately. Support wash-out process with slight agitation or a gentle rub with your finger. The material is reusable and can be used a long time, although it might change color. DEV-1 is perfectly safe for operator and environment. 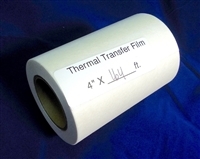 Thermo Stencil material to be used with your Label Printer. Compatible to Brother P-Touch P700 and printers that use a TZe type cassettes. Create artwork on your PC and print out on your Label Printer. The stencils material will produce a detailed, clean mark. Use 1 stencils for up to 10 etches. Deep etching is not possible. Photo Self Stencil Material is an in-house stencil solution for customers with a need for a quick turnaround. The material offers great detail reproduction and is rigid enough for many surface and deep etches. Our stencil foil is a coated paper similar to wax paper. The mark is physically embossed by a dot matrix printer or typewriter. Each stencil can be used 2-3 times, then it has to be discarded. This is our go-to solution for serial numbers. The mark quality is decent, but you are limited to the layouts that you can get out of your dot matrix printer. This item comes in sheets of 8x11 inches (letter size) and the pack has 100 sheets. Self Stencil Material for your thermo printer. The ideal solution for quick turnaround and local solutions. This item comes on a roll with 500 ft of material. The blue foil itself is 3.75" wide. The carrier material is a pin-feed paper, the center of the holes are 5" apart, the overall width of the roll is 5.5". This package contains 10 sheets Photo Self Stencil Material is an in-Photo Self Stencil Material is an in-house stencil solution for customers with a need for a quick turnaround. The material offers great detail reproduction and is rigid enough for many surface and deep etches.